By Louis Jacobson on Friday, April 12th, 2019 at 10:00 a.m. Even by the atypical standards of the Trump administration, recent days have brought an unusually large upheaval in key administration personnel. On April 7, Homeland Security Secretary Kirstjen Nielsen resigned, reportedly under pressure. The following day, Secret Service Director Randolph (Tex) Alles was ousted. On April 9, the acting No. 2 at Homeland Security, Claire Grady, said she was resigning. Then on April 10, Ron Vitiello, the acting director of Immigration and Customs Enforcement, was out of a job. The tweet drew more than 113,000 likes and was shared elsewhere on social media. We decided to check whether Schiff was accurate -- and to take the opportunity to place the Trump administration’s overall rate of transition into historical context. Here’s a chart detailing some of the key details about each of the positions Schiff mentioned. It’s based on news releases, news coverage and inquiries to agencies and independent observers. While the chart largely backs up the overall message of Schiff’s tweet, it’s worth noting that his use of the word "vacant" is a bit of an exaggeration. In the case of the Secret Service director, career official James Murray has been tapped to take over the agency on a permanent basis beginning in May. The position does not require Senate confirmation. In the meantime, the term "vacant" is a bit of an exaggeration for posts where an acting occupant has been serving for months, such as the Defense Department. And it’s also an incomplete description of positions for which Trump has made a nomination, since the ball is now in Congress’ court to fill those posts. When we ran this by Schiff’s office, Emilie Simons, a spokeswoman, acknowledged the technical distinctions. "Vacant is a shorthand term, and the key point is that having Senate confirmed and/or permanent leadership in posts of core national security responsibility is vital," Simons said. How does the Trump administration’s rate of transition compare overall? A running tally by the Washington Post and the Partnership for Public Service reports that 433 confirmable officials are now serving. Another 134 have been nominated but not yet confirmed, 11 have been announced but are awaiting an official nomination, and 143 posts have not had names put forward yet. That’s a good number of unfilled positions for an administration that’s already several months into its third year in office. We can also look at this question using another running measurement of administration turnover that is maintained by Kathryn Dunn Tenpas, a senior fellow at the Brookings Institution. Her most recent published summary was released in April 2019. 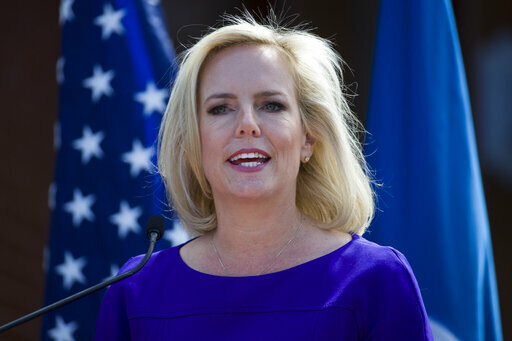 She tracks two separate groups of administration hires -- the "A" team, which includes officials in the executive office of the president but not cabinet secretaries, and cabinet secretaries alone. Among Trump’s "A Team," 66 percent of positions have seen at least one turnover through April 8. In Trump’s first year, 34 percent of "A team" positions saw turnover -- double the previous high going back to President Ronald Reagan. In Trump’s second year, 31 percent saw turnover, the second highest level, trailing only Reagan with 40 percent. Most strikingly, even though Trump is barely into his third year, his 66 percent overall turnover is higher than either George H.W. Bush or George W. Bush had over their full four-year first terms. More than one-quarter of those departures have had "serial turnover" -- more than one cycling in personnel. 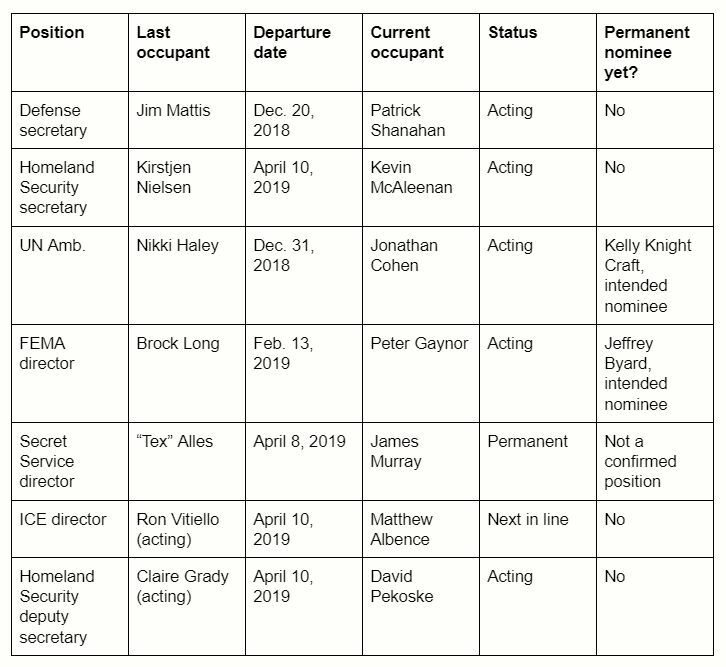 And at least 14 of the departures under Trump were cases in which the official resigned under pressure. As for the Cabinet, three Trump secretaries left in the administration’s first year; by contrast, none had left in the first year under Presidents Bill Clinton, George W. Bush or Barack Obama. Ten more left in Trump’s second year. All told, 15 Trump Cabinet members have left since he took office, which is higher than any president going back to Clinton, despite Trump’s being in office for a shorter period of time. Tenpas told PolitiFact that high rates of departure among Senate-confirmed appointees amount to a waste of the collective efforts of administration officials, the FBI and Congress in shepherding a nominee through confirmation. And while Tenpas sees the benefits of flexibility in appointing acting officials, as the administration has often done, she added that there’s nothing like having a duly installed permanent office-holder. "There are drawbacks," she said. "If you’re acting, you’ll be perceived as temporary. You may not get the same respect, and subordinates may delay decision-making until there’s a permanent person in place. And when there finally is one, they’ll have to work through a backlog." Max Stier, president and CEO of the Partnership for Public Service, compared an acting official to a substitite teacher. "They can be wonderful people, but they’re not set up for success," he said. "They don’t get the respect of the classroom and they don’t perceive themselves as having complete authority."